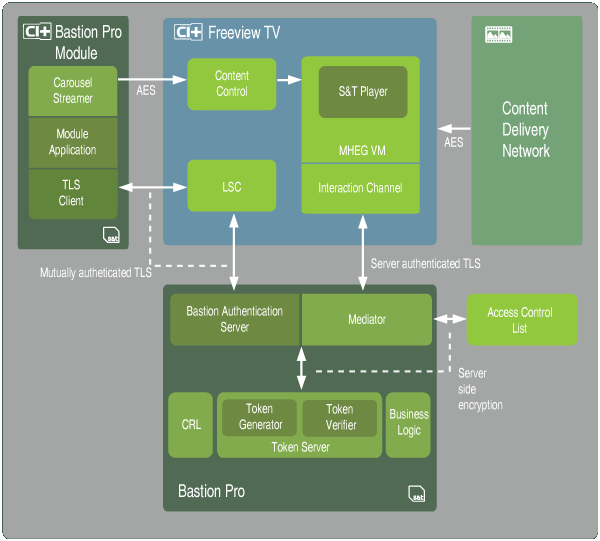 Bastion Pro allows operators to deliver premium content over-the-top (OTT) to Freeview TVs using hardware based authentication, enabling a secure solution for IP video services. The unique system provides a seamless experience for consumers as they access Bastion Pro protected services via the standard Freeview EPG and use their existing remote control. Strategy and Technology have made use of the widely deployed CI Plus technology to create a neat, cost-effective system that utilises a custom-designed CI Plus module. The Bastion Pro authentication mechanism works such that the CI Plus module pairs with the TV host and the CI Plus module is then authenticated by the Bastion system server, thus providing a secured hardware identity for the target module/host combination.